Stepping aside to let others into the spotlight, Halyma was here, but now she’s relaxing with a mojito and some shawarma in a hammock! 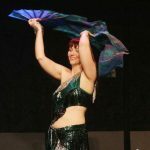 IF you are looking to start taking belly dance lessons or connect with some of Ottawa’s Performers, please check out Eurika’s website and especially her “Dance Map” page! Tracey-aka Halyma- Vibert has been in love with dance since childhood. She has dabbled in ballroom, jazz, hip hop, and began to focus primarily on belly dance in 1995, adding Bollywood to her repertoire in 2008. She teaches, performs, and encourages the Ottawa community to come together in a supportive atmosphere with her weekly online newsletter, the Dancers’ News. Her style is a blending of various middle eastern and north african “dialects” of bellydance, which she refers to, with all respect, as Canadian belly dance. She also offers 2 levels of instructional dvds for those wishing to practice at home, or try it out before signing up for a class. 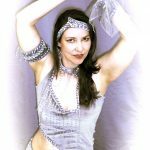 As a professional performer and teacher, Halyma is always ready to bring her love of belly dance directly to you! Through private lessons, mini and full workshops, she can carry her relaxed teaching style into your home, place of work or other suitable location. And for either solo performances or group productions with the Belly Dancing For Fun!!! Dancers, Halyma emerges to entertain, tastefully and with a fun energy that gets everyone up dancing! You can also register for any of her weekly classes in Ottawa to get that full intensive learning of this ancient dance form! 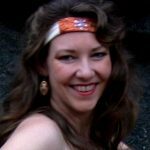 true to the punchline of your blog “Where she speaks her mind and shares her thoughts!”, i found you quite a friendly indiidual, sensitive to feelings and above all extrovert…. It is just by chance i visited your blog, am in little hurry but whatever writing of yourt i could scan , i feel you are quite and extrovery, frank and cheerful person and so you deserve atleast a compliment, even if i am in hurry……see ya later……………. I just wanted to say Thank You! A million times. I’d write it a million times if I could. The feedback from the dancing was so amazing. Everyone really enjoyed having you to watch/learn from while they were waiting in the lines. So I just wanted to let you know how positive/awesome your contributions was! Thank you for being patient with our sound system. The DJ really wanted to steal your music at the end of the night, and the reviews on our evaluation forms were wonderful! Thank you for being so fantastic, you really, really made the event special!